Are you looking to enjoy your fire pit with friends and family throughout the spring and summer months? Before you light your pit, we just wanted to make you aware of six safety tips to follow, so that you can thoroughly enjoy your spring and summer nights ahead. Setting up the fire pit in the right location improves safety. Start with an even and solid surface. Make sure you pay attention to your surroundings as well. 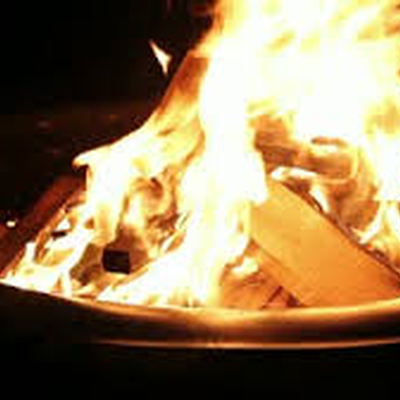 Finally, avoidÂ placing your fire pit near flammable objects like trees, brush and your home. Every fire pit operates a little differently, so make sure you read the owner’s manual for your model. Additionally, never operate an outdoor unit indoors and always have a garden hose or fire extinguisher handy. You may have invited friends over for a relaxing night by the fire, but never start a fire while a strong wind is blowing. Doing so could create an inferno that quickly grows out of control.Â Likewise, avoid using accelerants to start the fire, like lighter fluid! Instead, tinder like newspaper and twigs should be enough to successfully start a fire without creating a safety hazard. Although sparks look harmless, Â they can be quite dangerous! Make sure you use a fire screen to prevent errant sparks. You’ll also want to sit at a safe distance away from the fire and keep an eye on it. Extra supervision of children and pets may also be required, who may be tempted to get too close. Despite your best safety precautions, burns can happen as when you hang out near the fire pit. Keep a first aid kit and burn cream nearby in case an accident does occur. Make sure you follow the recommended procedures for burn treatment, and consult a medical professional if necessary. After your evening of fun, douse the fire and the ashes with water, Â so the fire doesn’t smolder and flare while you’re sleeping. This spring, spend your evenings relaxing around your fire pit, secure in the knowledge that you’re balancing fun with security. Just be sure to follow these six safety procedures to keep you, your friends, and family safe. Of course, if you have any questions or concerns about your home insurance policy, call Tracy-Driscoll today at 860-589-3434.